Shingles is a painful rash, usually taking several weeks to settle, that occurs most often on one side of the body. The first symptoms of shingles are often intense pain, burning or tingling on an area of skin on the trunk or face. This may be associated with a general feeling of being unwell or a fever. 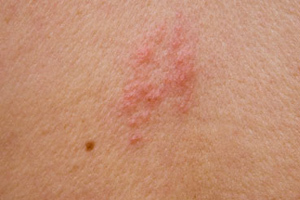 After 2 to 3 days, a painful red rash appears on this area of skin, often distributed in a band across one side of the body or face. The rash begins as a group of small red bumps that quickly become fluid-filled blisters. The fluid in these small blisters then becomes cloudy, and they break open to form a crusty surface. After about 5 days, no further blisters appear, although it can take up to 5 weeks for the skin to heal and return to normal. The rash can be very painful. Even a gentle breeze or a light touch can cause strong pain. Shingles is caused by the same virus that causes chickenpox (varicella zoster virus). After someone has recovered from chickenpox, the virus remains in their body, in an inactive state in the nerves that supply sensation to the skin. Years or decades later, in about 10 to 20 per cent of people who have had chickenpox, the inactive virus will become active again. When reactivated, the virus multiplies and spreads along the nerve it has been occupying, to the area of skin supplied by that nerve, where it causes the pain and rash of shingles. Shingles is not contagious, in the sense that you do not catch shingles from someone else who has shingles. You can only get shingles if you have had chickenpox in the past. What triggers the chickenpox virus to become active again and cause shingles is not clearly understood. However, it is thought that some decrease in the strength of your immune system (even if only temporary, such as can occur with a cold) is needed to allow activation of the virus. Once you have had chickenpox, it is very rare for you to get chickenpox again, although it is possible for you to develop shingles at some time in the future. The risk of getting shingles increases as you get older, especially once past the age of 50. This tendency for shingles to occur in later life may reflect the slight weakening of the immune system that occurs as we age. People who have a severe illness such as cancer or whose immune system is weak are at increased risk of developing shingles. For example, people who have AIDS, who are taking medication that suppresses their immune system following an organ transplant, or who are having radiation treatment or chemotherapy for cancer, can develop shingles more easily than people whose immune system is healthy. When the immune system is damaged or suppressed, shingles can be severe with an increased likelihood of complications. Antiviral medication has the best results if started within 3 days of the rash appearing. It will not stop shingles occurring, but can make it last a shorter time and lessen its severity. Antiviral medication may also reduce the risk of continuing pain after the rash has settled (a complication of shingles called post-herpetic neuralgia, see below). So, if you think you have shingles, visit your doctor as soon as possible, so you can be prescribed antivirals. Shingles can also be treated with lotions, pain relieving medication, occasionally corticosteroids and, if the blisters become secondarily infected with bacteria (as can occur with scratching), antibiotics. Over-the-counter pain-relieving medications such as paracetamol may be needed. Cool wet compresses and aluminium acetate lotion can help with the itch. Not scratching the rash can help avoid scarring. Shingles in younger people who have a healthy immune system is likely to resolve without complications. Shingles in older people can also resolve without complications, although around half of those over 50 who have shingles experience continuing nerve pain called post-herpetic neuralgia (PHN). PHN can be an extremely painful and debilitating condition, sometimes making it difficult for a person to carry out their usual daily tasks and resulting in weight loss, depression and a loss of independence. It starts after the rash has settled and can last from a few weeks to months or years. The pain of PHN may not respond well to usual pain medications. Instead it may need to be treated with alternative pain medications prescribed by your doctor such as anticonvulsants, antidepressants, local anaesthetics, and creams containing capsaicin, an extract of red chilli peppers. Shingles that affects the eye can result in temporary or permanent loss of sight in the affected eye. If you have shingles that is affecting your eye you will usually be referred to an eye specialist (ophthalmologist) for treatment. Occasionally shingles can affect the ear and damage your hearing. Rarely, in people who have other severe illnesses or a very weak immune system, shingles can result in spread of the chickenpox virus to internal organs such as the lungs. This complication can result in a severe and sometimes life-threatening illness. Shingles vaccination is one of the recommended vaccinations for older people. There is a vaccine available for adults aged 50 years or older, called Zostavax, that can help prevent shingles and its complications. While being vaccinated cannot guarantee that you won't get shingles, it does reduce the probability. Among those who do get shingles despite being immunised, the vaccine can reduce the pain associated with shingles and help prevent post-herpetic neuralgia. The vaccine is not intended to treat people who already have shingles. Zostavax protects against shingles for approximately 10 years. Shingles vaccination will be free to those aged 70, as part of the National Immunisation Program, from November 2016. Free catch-up vaccination will also be offered to those aged 71 to 79. A vaccine that protects people from getting chickenpox is also available for healthy adults and children older than 9-12 months. Children and adults who are not immune to chickenpox (generally this means they have never had chickenpox) have the option of receiving this vaccine. The Australian National Immunisation Program Schedule includes free routine vaccination against chickenpox at 18 months, as part of MMRV (measles, mumps, rubella and varicella) vaccination and at 10-13 years for children who missed the childhood vaccination. The vaccine is not 100 per cent effective in preventing chickenpox in every person who is given the vaccine. However, if chickenpox does occur in a person who has been vaccinated, the illness is likely to be less severe. 2. Therapeutic Guidelines (eTG). Herpes zoster: antiviral therapy. Updated Oct 2014. Available from: http://www.tg.org.au/ (accessed Sept 2015). 3. Immunise Australia Program. Herpes-zoster (shingles). Updated Aug 2015. http://www.immunise.health.gov.au/internet/immunise/publishing.nsf/Content/immunise-herpes-zoster (accessed Sept 2015). 4. Mayo Clinic. Shingles. Updated Dec 2014. http://www.mayoclinic.org/diseases-conditions/shingles/basics/definition/con-20019574 (accessed Sept 2015). 5. Immunise Australia. Varicella (chickenpox). Updated April 2015. http://www.immunise.health.gov.au/internet/immunise/publishing.nsf/Content/immunise-varicella (accessed Sept 2015).